The Facility Management Station (hereinafter “FMS”) supports building maintenance function and energy management function to improve both efficiency and quality of maintenance operations. For asset management and facility management, the information about managed facilities is managed as a database. The database is used for the following purposes. For energy management, point data of digital points, analog points, and totalized points are automatically collected from sub systems via savic-net™FX Building Management System and saved as a database. 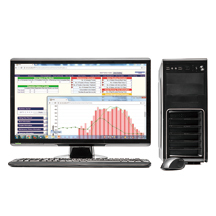 The database is totaled for the respective periods for daily, monthly, yearly, year unit reports to illustrate energy consumption and operating status in graphs and graph data. For tenant service, the following functions are available.